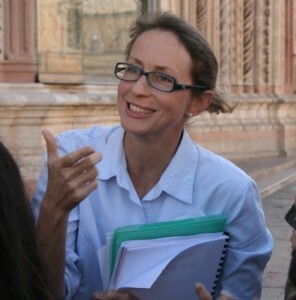 Pippa Salonius is a New Zealander with an international formation in medieval and Renaissance art history. She completed her laurea in art history under the supervision of Professor Luciano Bellosi at the University of Siena in Italy and her PhD with Professor Julian Gardner at Warwick University in the UK. She has been awarded research scholarships and funding from institutions such as the Kunsthistorisches Institute in Florence – Max Planck Institute and the University of Florence. She has taught both Italian and North American university students in Italy and Canada. Her practical knowledge of museums has been acquired working in institutions such as the Museo dell’Opera (Cathedral Museum) in Siena, Italy and the National Gallery of Art in Washington, D.C. Currently, she is coediting a compiled volume of essays in art history entitled The Tree: Symbol, Allegory, and Mnemonic Device in Medieval Art and Thought, which will appear in the Leeds International Medieval Research series in 2014. She specializes in the art and architectural history of the Italian cathedral and the patronage of the papal court, with reference to the transmission and circulation of ideas both within and beyond the Italian peninsula. As an Ahmanson Research Fellow she will be examining the fourteenth and fifteenth-century Orsini Family Papers and evaluating the Roman baronial family’s appropriation of ecclesiastic benefices in relation to its patronage of the arts.